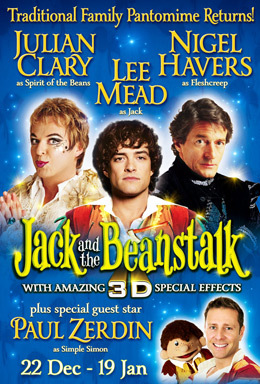 Julian Clary will play the Spirit of the Beans and he will be joined by the smooth-talking TV heart-throb Nigel Havers (currently appearing as Lewis Archer -Audrey Roberts’ love interest in Coronation Street) as Fleshcreep. Ventriloquist Paul Zerdin is making a special guest appearance as Simple Simon, with his cheeky companion Sam. Jack and the Beanstalk will run from Saturday 22nd Dec 2012 - Saturday 19th January 2013 Tickets are on sale on Friday 20th April from The Mayflower Box Office tel: 02380 711811, online at mayflower.org.uk or in person from the Mayflower ticket south shop.